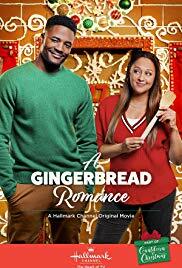 A Gingerbread Romance is the latest holiday movie that will debut on the Hallmark Channel on December 16 at 8 PM. With Christmas just weeks away, the architecture firm Taylor (Tia Mowry-Hardict) works for enters her in a contest in which the teams will design and build life sized gingerbread houses. After the contest, Taylor will likely be getting a promotion to a position in another city. The firm teams her up with Annabelle, a renowned French pastry chef with whom Taylor instantly locks horns. When Annabelle backs out, Taylor stumbles into a local bakery and meets Adam (Duane Henry), a baker and single dad. In an act of desperation, Taylor convinces Adam to partner with her for the contest, arguing that winning would give the bakery and his designs much needed exposure. For years Taylor has been resistant to call anywhere “home” for fear it will only be temporary. But the time she spends with Adam and his daughter Brook in their cozy home, decorating for Christmas, and exploring Philadelphia at Christmas, fills her with a longing for a place to call home. Here is a trailer for A Gingerbread Romance.